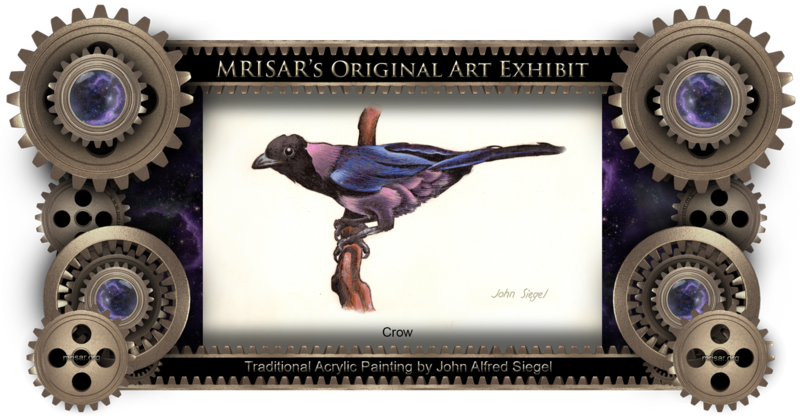 This is an Acrylic Painting of a crow by John Alfred Siegel, an awarded, published and exhibited, multi-disciplined artist and Zoo Keeper and Zoo Display Artist for the Detroit Zoo. He passed in 1988. He is the father of John Adrian Siegel and the Grandfather of Autumn Marie and Aurora Anne Siegel, all members of the MRISAR R&D Team. Most of his original works have two different versions, a standard version and an interactive version, both of which are included in MRISAR's traveling exhibitions. Additionally some of these two different versions are for sale and come in 3 forms: 1- as a one-of-a-kind piece; 2- as limited edition pieces; 3- as unlimited pieces. ​Contact us if you are interested in renting or purchasing any of our original art or photography pieces! Sales and rentals help to fund our philanthropic work! 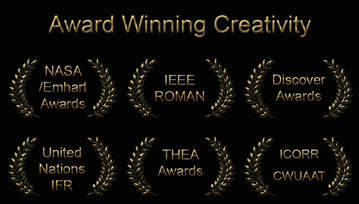 ​Art exhibits created by MRISAR's Award Winning R&D Team, a family of Artists-Engineers!